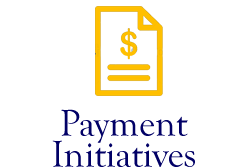 Many low-volume services struggle to produce high quality and competitive cost outcomes. Expanding bundling efforts put cardiac surgery episodes of care for low-volume providers at a competitive disadvantage. 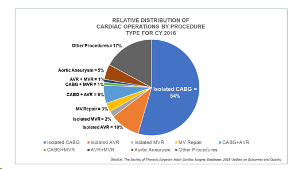 Nationally, CABG case volume is declining and cardiac valve cases are increasingly shifting to higher-volume, more specialized providers in many markets. The continued impact of catheter-based procedures including PCI and TAVR. The pursuit of “excellence” in an increasingly important survival strategy. 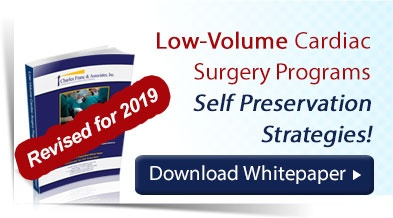 Low surgical volumes do not necessarily correlate directly with the volume of other cardiac procedures such as diagnostic cath, PCI, interventional vascular and cardiac rhythm management (CRM) device implants. Hospitals with and without cardiac surgery services can achieve excellence status and build thriving programs. 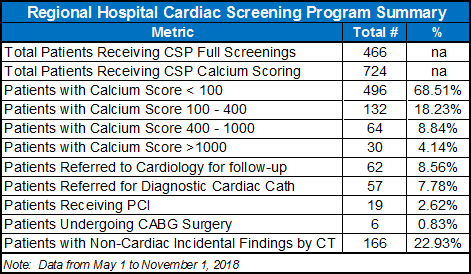 While low-dose coronary artery calcium scoring scans (CAC) using CT have been around for some time, their effectiveness and relatively low cost in assessing cardiac risk seems to be taking on a new life. 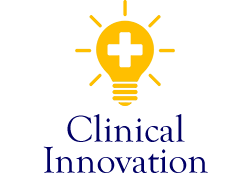 Accumulated wisdom and several newer studies have added to the body of clinical knowledge about CAC.